From the 1990s to the early 2000s, Chris Bennett published a series of papers that are now considered the gold standard for understanding pteranodont biology, stratigraphy, and anatomical variation. 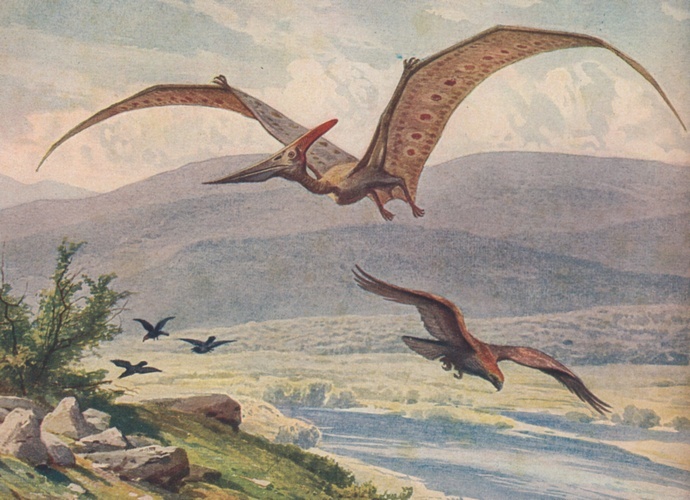 Bennett concluded that despite their wide variety of crest shapes and body sizes, Pteranodon could be divided into two species - the earlier species Pteranodon (or Geosternbergia) sternbergi, and the later species P. longiceps. P. sternbergi had a large, upright, "bulbous" (though actually just flat and convex) crest. P. longiceps was the classic Pteranodon everybody knows, with a usually backward-directed narrow crest. But also, within each species, there were two varieties. A larger variety with a large crest and narrow hips, and a smaller variety with a small crest and wide hips. Bennett provided evidence that these varieties represented sexual dimorphism. The smaller specimens were female, and their wider hips allowed more room for eggs to pass through. The larger, showier specimens therefore must have been the males. 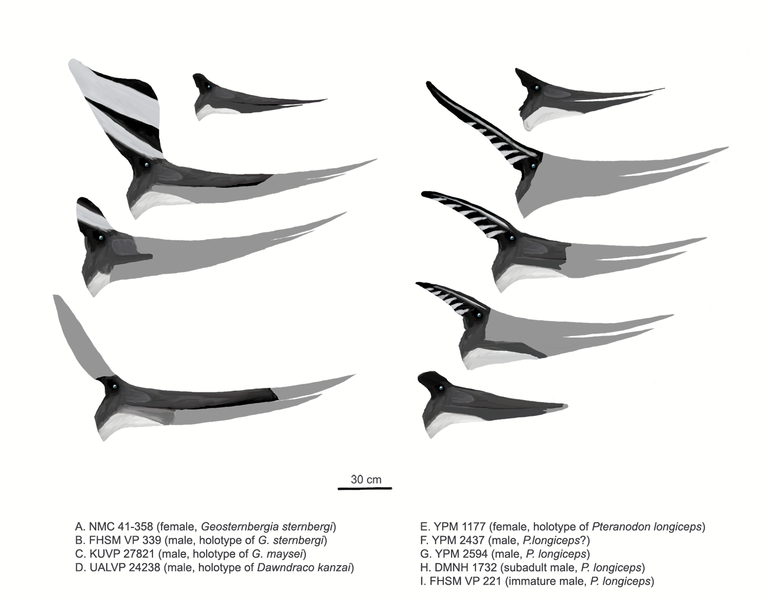 As I discussed in a blog post several years ago, Alexander Kellner, in a 2010 paper, argued that Bennett's arrangement was incorrect, and that pteranodontids could be divided into several species based on small variations in their skulls. Most notably, he decided that one particularly complete specimen, UALVP 24238, which Bennett considered a male P. sternbergi, was actually a female specimen of a brand new species, Dawndraco kanzai. This was inspired by several supposedly unique features, most notable a very tall bill which, while incomplete, had a top and bottom margin that were nearly parallel for their preserved length, which is pretty long! This gradual taper, taken to its natural apex, would have given the animal an incredibly long, sword-like bill. Bennett had suggested that the height of this bill was due to a crest running along its top margin. In Kellner's view, this height meant that the species must have been characterized by a very long and tall bill not seen in other pteranodonts. Comparison of various pteranodont skulls. Note that "G. maysei" is probably P. longiceps rather than part of the P. sternbergi group, or possibly a chronological third species. By Matt Martyniuk, all rights reserved. After examining the issue while making the illustration that accompanied my blog post (re-posted above), I came to agree with Kellner about the bill - it looks like the bill, as preserved, was just very, very long and gradually tapered. But later on, when creating my digital painting of Pteranodon longiceps (below), the most likely interpretation of all this is not that Dawndraco is unique in having an enormous bill, but rather that most depictions of male Pteranodon bills are simply wrong. Take a look at the diagram above carefully. I reconstructed all the male P. longiceps (column on the right) with a traditional bill style. But as you can see, almost no complete male P. longiceps bills are known. The only complete ones are small, immature individuals that look more like the complete skull of the holotype, which is female. The only thing we have that's even close to a somewhat complete adult male Pteranodon bill is the holotype of P. sternbergi, which as you can see, is just as broad as the bill of Dawndraco. In fact, though it seems to taper a bit more sharply than Dawndraco, the tip of the bill is actually partly reconstructed. Mark Witton came to a similar conclusion - see his excellent blog post on the issue for a heavily illustrated guide to the "Pteranodon complex". Male Pteranodon longiceps with a "Dawndraco"-style bill. A new open-access paper by Elizabeth Martin-Silverstone, James Glasier, John Acorn, Sydney Mohr, and Phil Currie came to just about the same conclusion Witton, I, and others did. They tested all of these hypotheses based on a new examination of the fossil and comparison with other pteranodont specimens, and found that "Dawndraco" is probably just a male P. sternbergi as Bennett originally thought. The specimen is probably a young adult, which explains the relatively small crest (though this is incompletely preserved). These scientists allow that the presence of a crest could still be used to explain the height of the bill, but as I reconstructed above, and as the authors also state, it's not really necessary. 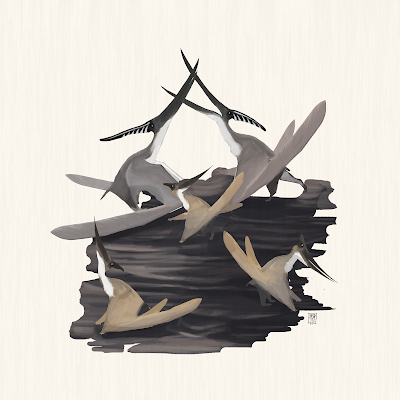 Adult male pteranodonts probably just had larger bills, just as they have larger crests. In light of this, it seems that most Pteranodon illustrations are incorrect, having short bills based on female or immature specimens, rather than large, sword-shaped bills like the one in the "Dawndraco" specimen. In my illustration below, I hypothesize that they may have used these in some sort of "sword fighting" competitions for mates. I show two large male P. longiceps with appropriately long "sword bills", rather than the traditional shorter bills that actually characterize females like the ones roosting on the same rocky islet. Sword-billed male Pteranodon longiceps compete for females. By Matt Martyniuk, all rights reserved. There is a large male skull, bigger than UALVP specimen by far, on display at the LACM. Although frustratingly just as incomplete as the Alberta skull, it also demonstrates the long deep bill. Also, there are isolated large bills for P. longicieps that suggest they may not have been as deep as P. sternbergi. I work at LACM and can confirm this. Our P. longiceps skull is massive, about 6ft long including the crest, and it also shows this deep condition. Seeing the LACM specimen every day while also getting the chance to see the holotype Dawndraco material, I failed to notice any of the supposed differences in the jaw shape between the two. Could be for some sort of swordfish/sawfish like feeding strategy instead?